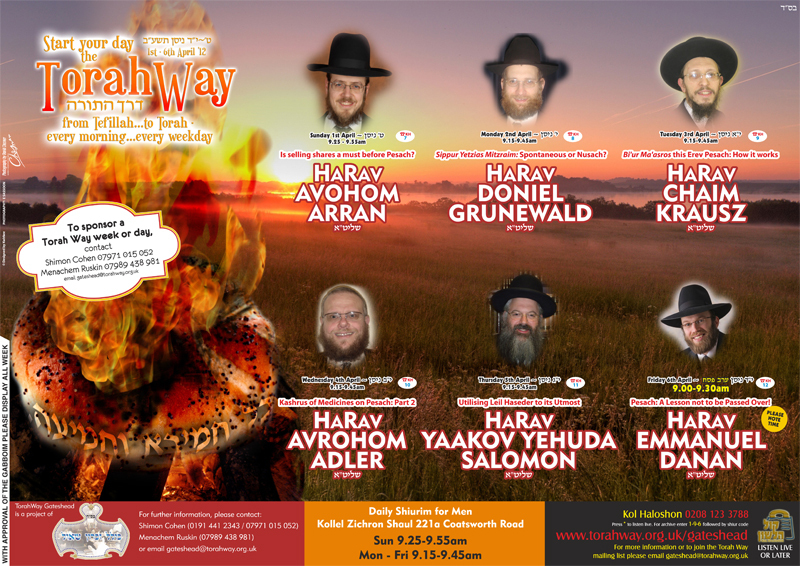 Sun 13/5/2012 HaRav Chanoch Gruner - "Background to Netilas Yodayim"
Mon 14/5/2012 HaRav Yosef Chaim Mimran - "Pesach, Omer, Shavuos: A Deeper Dimension"
Tue 15/5/2012 HaRav Ya'akov Cohen - "What milk will you be drinking on Shavuos"
Wed 16/5/2012 HaRav Chaim Lauer - "The benefits of Chazoroh"
Thu 17/5/2012 (MP3 to follow, Click for WAV Format) HaRav Dovid Silkin - "Lo Nitnoh Torah Elo Le'ochlei Hamon"
Fri 18/5/2012 (MP3 to follow, Click for WAV Format) HaRav Avrohom Weiniger - "The Window to Heaven!" 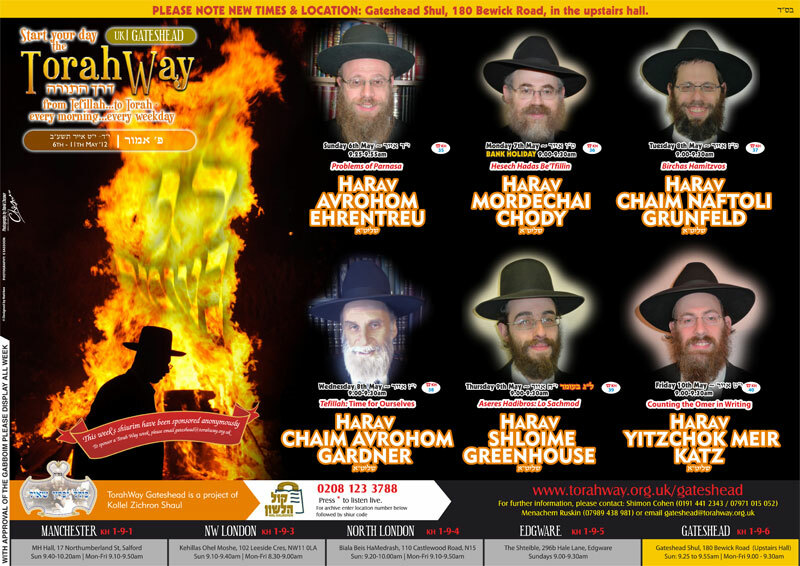 Sun 6/5/2012 HaRav Avrohom Ehrentreu - "Problems of Parnasa"
Mon 7/5/2012 HaRav Mordechai Chody - "Hesech Hadas Be'Tfillin"
Tue 8/5/2012 (MP3 to follow, Click for WAV Format) HaRav Chaim Naftoli Grunfeld - "Birchas Hamitzvos"
Wed 9/5/2012 HaRav Chaim Avrohom Gardner - "Tefillah: Time for Ourselves"
Thu 10/5/2012 HaRav Shloime Greenhouse - "Aseres Hadibros: Lo Sachmod"
Fri 11/5/2012 HaRav Yitzchok Meir Katz - "Counting the Omer in Writing"
Sun 29/4/2012 HaRav Yaakov Zvi Saberski - "K'rias HaTorah from a Sefer Torah that was found Possul"
Mon 30/4/2012 HaRav Yechezkel Ehrentreu - "Can a Kotton have a Wife?" 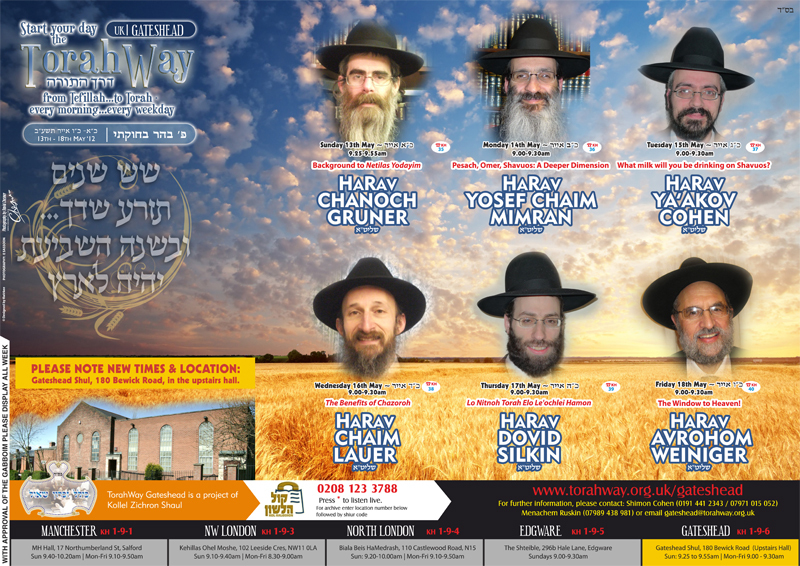 Tue 1/5/2012 HaRav Yaakov Aronovitz - "Sofeik Mitzvah D'Rabbonon and its Brocho"
Wed 2/5/2012 HaRav Mordechai Abenson - "Be'Inyan Me'ah B'rochos"
Thu 3/5/2012 HaRav Dovid Zahn - "Jumping to Conclusions"
Fri 4/5/2012 HaRav Doniel Orzel - "Shiur and Demonstration on Mafris Parsoh, Tumoh, Mikvah"
Sun 22/4/2012 HaRav Shmuel Wolf - "Beinyan Kiddush Levonah"
Mon 23/4/2012 HaRav Yaakov Moore - "Sefiras HaOmer: Zecher LeMikdosh or Hachonoah LeMatan Torah?" 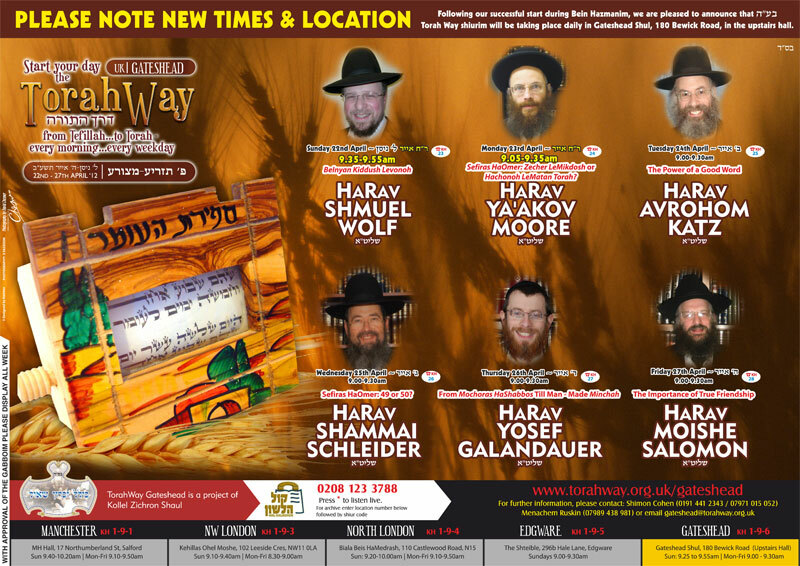 Tue 24/4/2012 HaRav Avrohom Katz - "The Power of a Good Word"
Wed 25/4/2012 HaRav Shammai Schleider - "Sefiras HaOmer: 49 or 50?" 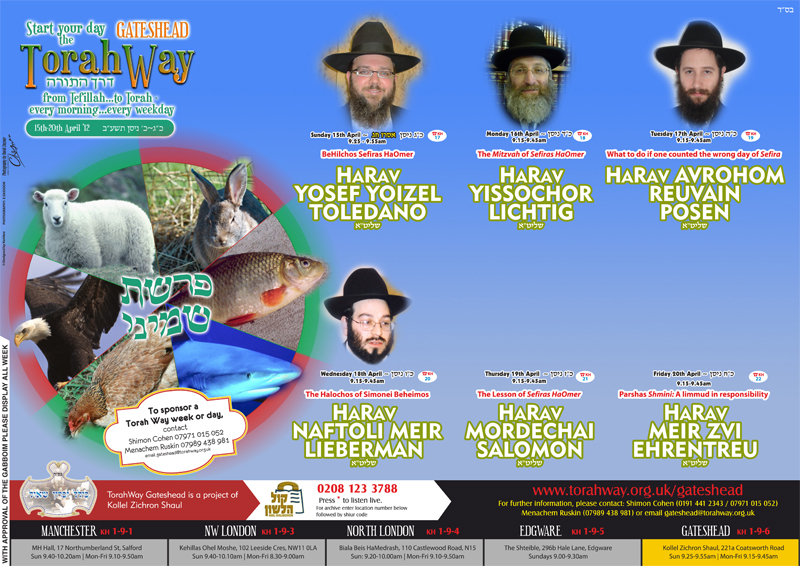 Thu 26/4/2012 HaRav Yosef Galandauer - "From Mochoras HaShabbos Till Man-Made Minchah"
Fri 27/4/2012 HaRav Moishe Salomon - "The Importance of True Friendship"
Sun 15/4/2012 (MP3 to follow, Click for WAV Format) HaRav Yosef Yoizel Toledano - "BeHilchos Sefiras HaOmer"
Mon 16/4/2012 (MP3 to follow, Click for WAV Format) HaRav Yissochor Lichtig - "The Mitzvah of Sefiras HaOmer"
Tue 17/4/2012 HaRav Avrohom Reuvain Posen - "What to do if one counted the wrong day of Sefira"
Wed 18/4/2012 HaRav Naftoli Meir Lieberman - "The Halochos of Simonei Beheimos"
Thu 19/4/2012 HaRav Mordechai Salomon - "The Lesson of Sefiras HaOmer"
Fri 20/4/2012 HaRav Meir Zvi Ehrentreu - "Parshas Shmini: A limmud in responsibility"
Mon 9/4/2012 HaRav Michoel Fletcher - "On the way to the Mini Kabbolas HaTorah and the Grand Kabbolas HaTorah"
Tue 10/4/2012 (MP3 to follow, Click for WAV Format) HaRav Mordechai Steinhouse - "Matzah Kol Shivah"
Wed 11/4/2012 HaRav Moshe Dovid Spiro - "Pesach: Interesting Sha'alos"
Thu 12/4/2012 (MP3 to follow, Click for WAV Format) HaRav Boruch Shimon Barnett - "Tefillos Avos Tiknum"
Sun 1/4/2012 HaRav Avrohom Arran - "Is selling shares a must before Pesach?" Mon 2/4/2012 HaRav Doniel Grunewald - "Sippur Yetzias Mitzraim: Spontaneous or Nusach?" 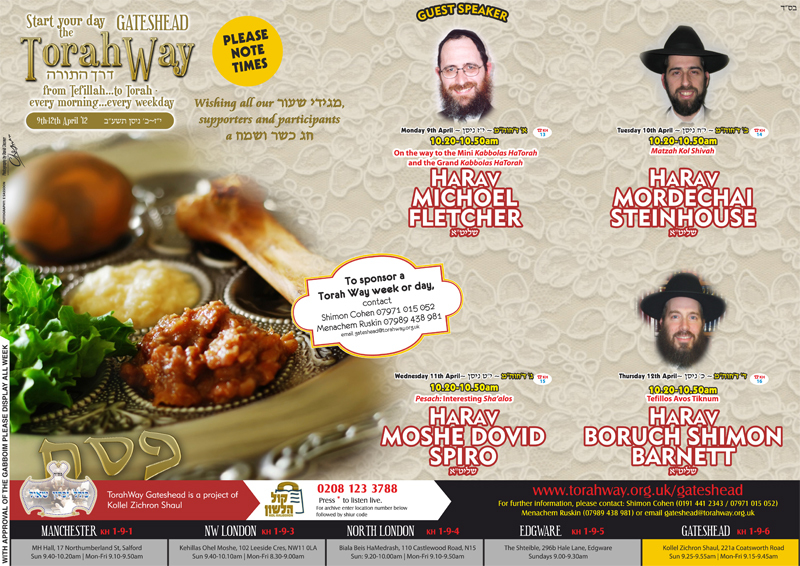 Tue 3/4/2012 (MP3 to follow, Click for WAV Format) HaRav Chaim Krausz - "Bi'ur Ma'asros this Erev Pesach: How it works." 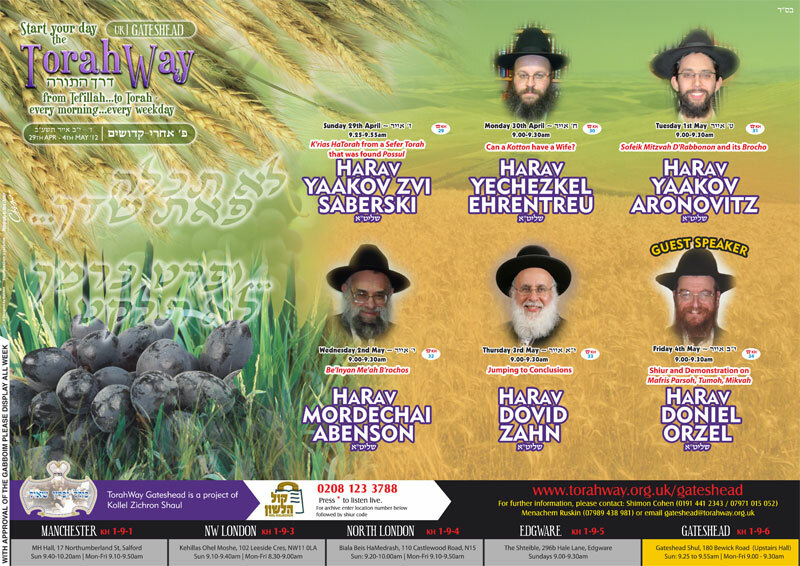 Wed 4/4/2012 (MP3 to follow, Click for WAV Format) HaRav Avrohom Adler - "Kashrus of Medicines on Pesach, Part 2"
Thu 5/4/2012 (MP3 to follow, Click for WAV Format) HaRav Yaakov Yehuda Salomon - "Utilising Leil Haseder to its Utmost"
Fri 6/4/2012 (MP3 to follow, Click for WAV Format) HaRav Emmanuel Danan - "Pesach: A lesson not to be Passed Over!" 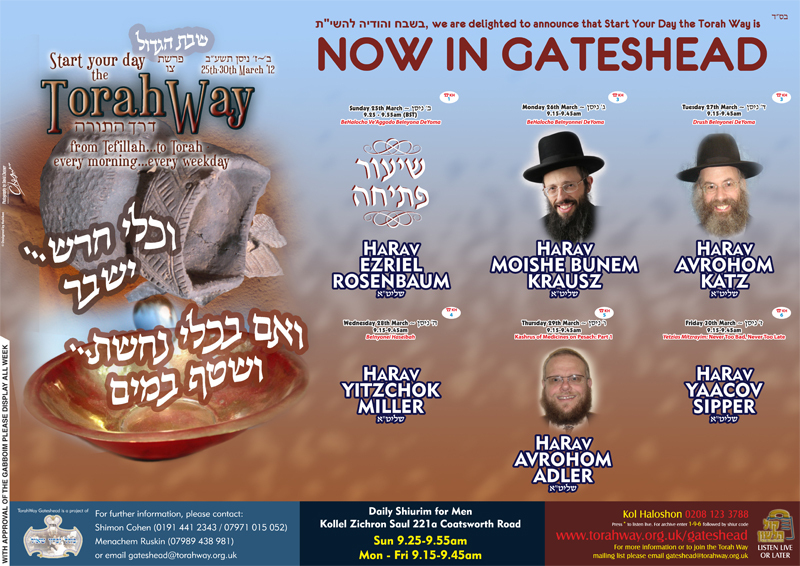 Sun 25/3/2012 HaRav Ezriel Rosenbaum - "BeHalocho Ve'Aggodo BeInyona DeYoma"
Mon 26/3/2012 HaRav Moish Bunem Krausz - "BeHalocho BeInyonnei DeYoma"
Tue 27/3/2012 HaRav Avrohom Katz - "Drush BeInyonei DeYoma"
Wed 28/3/2012 HaRav Yitzchok Miller - "BeInyonei Haseibah"
Thu 29/3/2012 HaRav Avrohom Adler - "Kashrus of Medicins on Pesach - PART 1"
Fri 30/3/2012 HaRav Yaakov Sipper - "Yetziyas Mitzrayim, Never too Bad, Never too Late!"